In my previous blog post, I discussed a brief history about ASP.NET Webforms/MVC applications and its deployment to IIS. Then we took a look in the new framework ASP.NET Core which was introduced keeping in mind the performance and cross platform readiness. As performance was one of the key drivers, they introduced entity framework core and all thenew web server named Kestrel. You can read the blog post here. We discussed about ASP.NET MVC Core 2.1 and discussed some internal details about its deployment on IIS as a reverse proxy (which is recommended), and also took a look on using Kestrel as an Edge Server. Although Kestrel is matured enough to be used as an Edge Server but still IIS is considered better option. We also saw, how ASP.NET Core requests are handled by IIS. We need to install the .NET Core Hosting bundle (download here) which adds a module named ASP.NET Core Module (ANCM). ANCM is responsible to route the asp.net core request to Kestrel. We can see that there is no dotnet.exe is involved here in the second part. All the components ANCM, CoreCLR and application code are loaded in same worker process. Why new version of ASP.NET Core Module (ANCMv2)? Earlier the idea with ANCM to use IIS as a reverse proxy and leverage Kestrel as a backend web server (as it was not hardened enough as an edge server) but as Kestrel got all the required enhancements, MS reworked on ANCM so that IIS can be used another platform to host asp.net core applications without the need of Kestrel. ANCM got redesigned and divided in two components, a shim and a request handler. Shim – As the name suggests, it is a very light weight component which is continue to be installed as a global module via bundle which just work as an interface between IIS and request handler. Request Handler – Request Handler is now an independent component which does all the work and can be updated via nuget. We can have multiple versions of request handler side by side. It means we can have multiple application using its own request handler. With earlier ANCM, it was available as global singleton module which is shared by all the application which is a major bottleneck in releasing newer versions as it has to support every application. With the new architecture, we also get better process management, performance enhancements and easy updates via nuget. We have so many benefits with the new model however we have one limitation – one application pool can only host only one application (In ASP.NET Web Form/MVC we could share app pools with multiple applications) as we don’t have the concept of Application domains in CoreCLR and this feature supports to CoreCLR only. Now I have created another sample web application application using ASP.NET Core 2.2 (used VS 2017 v15.9.4) and deployed to IIS after publishing that. Just to compare with earlier version I am adding both here. So we can see the difference, in first scenario (<ASP.NET Core 2.2) the application is running under dotnet.exe while in second scenario, it is running under the worker process (w3wp.exe) itself which boosts the performance significantly as we don’t have to manage the dotnet process (earlier approach could have reliability issues as well) and request doesn’t have to travel outside of the process. Here we can see that request per second got increased significantly to 3742 which is approximate ~50% increase. Other data points like median, stddev also got reduced significantly. Itmay vary based on the scenario as I ran it on a developer VM and the application used was a default sample application using asp.net core 2.2 (not an empty application). However, Microsoft ran the test in performance labs where they got 4x throughput with In-process hosting. Even kestrel was introduced with ASP.NET Core as a highly performant web server or as an alternate to IIS, it was always suggested to use IIS as frontend server in windows environment. Initially, many important features were missing in Kestrel which got added with the release of asp.net core 2.0 and 2.1, still IIS is advised to use for enterprise environment and internet facing application mainly due to security and stability reasons. There were several bottlenecks with having two different processes (w3wp.exe and dotnet.exe) and the way like port conflicts/not available, process management etc. All these can be avoided using In-process hosting model. In last few years, I spent a significant amount of time researching, writing, speaking on ASP.NET application’s performance. Performance of a web app is not just its code but it depends a lot on the hosting platform, configurations and the usage of available resources etc. If you are hosting ASP.NET Webforms/MVC application on IIS, then you can follow below tips and get benefitted quickly. Any application can’t be highly performant until all three are properly optimized. It can perform better if all were taken in consideration in early stages development lifecycle. ASP.NET Web Forms is/was very popular web framework but it has many known performance issues. To overcome many and to use latest standards and best practices, Microsoft introduced ASP.NET MVC framework. Over time, Microsoft sensed the need of new highly performant cross platform web framework to compete in market and introduced the all new ASP.NET Core framework (Initial Name: ASP.NET 5) which is written from scratch. Although at a high level, most of the constructs are similar with ASP.NET MVC but the underlying engine got completely rewritten. While working on ASP.NET Core, MS worked on the complete stack, like for backend – they introduced Entity Framework core and for hosting the application, a new highly optimized web server, known as Kestrel. But as we know IIS provides an array of features, configuration and battle tested for all kind of scenarios, Kestrel was not ready as an edge server. Although the new server was introduced with ASP.NET Core but it appears that initially, the main focus was on ASP.NET core and other backend frameworks. During ASP.NET 1.X, it was advised to used IIS as frontend server which in turn forwards the requests to Kestrel. A reverse proxy was suggested due to security and reliability reasons. It didn’t have defense against attacks and other configurations like various timeouts, size limits, concurrent connection limits etc. So, we only had the option to deploy the application using IIS (Nginx, Apache for other platforms) as reverse proxy. In the newer versions (ASP.NET Core 2.X), lot of enhancements has been made in Kestrel and with ASP.NET Core 2.1 and later, Kestrel started supporting https (which is nowadays basic requirement for hosting any web application on internet). Now it can be used as internet facing server . In this post and coming post, we will discuss the available deployment options with IIS and explore that what is happening behind the scene. I created an asp.net core sample application which I deployed on IIS. Let’s take a quick look into the steps for deployment. First, we need to configure IIS on Windows (if it’s not there). Create a new logs folder inside the earlier created which will contain the logs created by ASP.NET Core module when stdout is enabled. In IIS, Add a new Website by right clicking on Sites folder under Connections -> ServerName as NetCoreProxy (say). “No Managed Code” why? We will discuss it later. Check the identity which is by default as “AppPoolIdentity” and change it if needed. Last step, publish the website by Right Clicking on the project in Visual Studio in the newly created folder at 3 a. While publishing an ASP.NET Core app, we need to select the deployment mode option which has two options: Framework dependent and Self-Contained. Publishing with second option produces a significantly larger binaries because it contains the coreclr and other required system libraries. This should not be a preferred option until necessary because of the huge size and performance implications as it loads all the resources and JIT them on the fly. Now we should be able to browse our ASP.NET core web site. The first question that arises is why do we need to install something on IIS? One of the problems with earlier versions of ASP.NET, that ASP.NET and IIS both has its own pipeline which contains multiple modules (IIS pipeline contains native and managed modules) and each request has to go through both the pipelines invoking each module (However this problem was resolve till certain extent using Integrated Pipeline setting at IIS). Most of the times, many of them are not used by the appliccation. Using ASP.NET Core, we got a new pipeline which has list of middleware that are added at application startup based on the need. To avoid all the IIS overheads, when we install the bundle on IIS, it adds a native module AspNetCoreModule (ANCM) which is invoked at very early stage and forwards the requests to Kestrel as soon as it reaches to IIS. Earlier it was done by an existing module called HTTP Platform Handler which used to forward the request but MS decided to create a new native module ANCM which was fork of HTTP Platform Handler to have better control and able to provide tailored features. Here we can see that dotnet.exe is a different process which runs the application. What is this Console Host process? If we take a look in ASP.NET core’s startup class, we will see a main method, similar to console application which is the first method which gets called when the application starts. The request is received by the HTTP.sys from the network. If response is cached at HTTP.sys then it is sent back from there else gets a place the corresponding Application Pool’s queue. When a thread is available in the thread pool, it picks up the request and start processing it. The request goes through IIS processing pipeline. As mentioned earlier the request goes through few native IIS modules and once it reaches to ANCM, it forwards the request to Kestrel (under dotnet.exe). ANCM has a responsibility to manage the process as well. If (re)starts the process (if not running or crashed) and IIS integration middleware configure the server to listen the request on port defined in environment variable. It only accepts the requests which originates from ANCM. Note -Please do note that in ASP.NET Webforms/MVC the application is hosted under the worker process w3wp.exe which is managed by Windows Activation Service (WAS) which was part of IIS. Once the request is received by Kestrel, it creates the HTTPContext object and request is handed over to ASP.NET Core middleware pipeline. The request is passed to routing middleware which invokes the right controller and action method (model binding, various filters almost similar way as earlier versions). Finally, the response is returned from the action and passed to kestrel via Middlewares and later sent back to client via IIS. So we can see the request processing is quite different than earlier versions ASP.NET apps hosted on IIS. As this post is specific to IIS hosting, I will not go into the detail but earlier lots of important web server features like Keep alive timeouts, connection timeout, body reading timeouts, request timeouts, size limits, concurrent connection limits, memory limits etc were not available but now most of the configuration can be done and it supports https as well. Even with that Microsoft suggests using IIS as a reverse proxy due to additional feature, security, configurations and many more. Hope you have enjoyed the post. Do share the feedback. In next post, We will discuss the In-process enhancement in ASP.NET Core 2.2 in detail. Partial Views and Child Actions are one the most used features of ASP.NET MVC. Partial Views provides us a way to create a reusable component that can be used in multiple Views. There are Actions which can be marked as Child Actions and these cannot be invoked via URL but inside views or partial views. Child Actions are no more available with ASP.NET Core. View Components are new way to implement this feature in ASP.NET Core. Partial Views has certain challenges and limitations. Say if we use child action in a view then while execution, an additional life cycle takes place, first ASP.Net MVC life-cycle executes for the loading the main View and once it gets loaded, another for the Child Action. Also, putting certain filter like Authorize over Child Action, used in layout, makes the complete page fail if authorization fails. It also does not support the awesomeness of async programming, test-ability, Separation of Concerns etc. View Component is one of the many awesome features introduced in ASP.NET Core. As mentioned earlier, View Components are similar to Partial View and enables us to write reusable component which can be used in multiple views. View Components are robust, leverages asynchrony, Dependency Injection friendly, follows separation of concerns which makes it easily maintainable and testable. ASP.NET Core recognizes the suffix and render it as view component. As this is a plain C# class, we would not have the basic MVC feature available like MVC Context etc. Note – For this example, I am using Visual Studio 2015 update 3 and ASP.NET Core 1.1.1. Complete code can be downloaded from here. It injects a new instance of service every time it is used in the application. There are few other options based on the scope and life time of instance. To learn more about dependency injection ASP.NET MVC core refer my previous post. Till now we have written code for supplying data to our component. Now it’s time to write the View Component. In the InvokeAsync method, we are passing a parameter noOfBooks and based on that we are fetching the books from bookRepository. 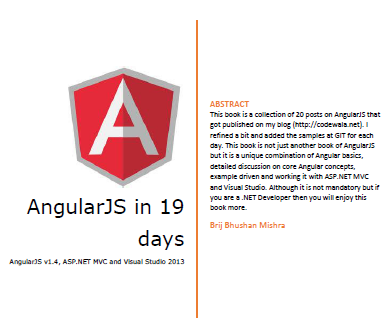 The items return by the repository contains the book image name which is getting converted in the complete URL so that it can be directly used on UI. Then we are passing these items in the view. We didn’t provide a view name, it finds a view with name Default.cshtml but we can also provide any other name as well. For that we need to pass the view name in string format, similar to normal controller returning named view. We can see that here the return type of this method is IViewComponentResult which is specific for View Component. This class looks like mini controller as it returns the view. It has only one method InvokeAsync which can be called from the specific View Component, not from the browser. It also provides another method InvokeAsync which can be used instead for async handling. We used here our BookRepository that we created and it got injected via constructor. Now we will move to step 2. If we want to use the View Component across multiple controllers, then first location should be used. On the other hand, if we want to restrict its usage to the same controller then second option should be chosen. It is similar like Views in the normal controller where if the action name and view name is same then we do not need to pass the view name else need to provide. It is like normal view where we have the list of books as in the model and we iterated that to display on the screen. Now the final step is to use the View Component in any view. It is very simple, we can invoke it at any place. Here the first parameter is the name of the view component and then the parameters that we used while implementation of InvokeAsync method. We used only one parameter number of books so here we are passing the same. Other important thing as we are using asynchronous method, we need to use await keyword as in the example else it won’t be rendered on the screen. So we can see that our view component is displayed as expected. It looks simpler and cleaner. To use any View Component, the tag should start with vc and the view component and parameter name are converted on lower kebab case (means all in lower case and if there is case change then a hyphen is inserted like TopBooks changed to top-books), it would not work if the naming is not properly used. So now you have the beauty of TagHelper with ViewCompoenent. In this post, we have seen that View Component is powerful feature of ASP.NET Core which can be used to write complex reusable controls for the application. It is loaded with separation of concern, async and testability features and similar to normal controller and view. We created a sample view component in step by step approach and used that in a view and used the power of DI for injecting Repository in our control. Also, we saw that in ASP.NET Core 1.1, it can be written as TagHelper which makes sure, we are not forced tow write C# code in the view J. Complete code is attached with the post. Millions of software has been built in last couple of decades which helped in coming up a set of patterns for resolving different problems and we have a ready reference as GoF design patterns from quite long now. In last decade, Inversion of Control and one of its implementation Dependency Injection (DI) became one of most used pattern across platforms for building great soft wares. Agile methodology for building software which focuses on small releases and more adaptive to the changes, made it very important tool. In this post, we will discuss Dependency Injection and different. Dependency Injection is a design pattern which is an implementation of Inversion of Control (IoC) that provides us a way to resolve dependencies. Objects works in collaboration model and the whole communication becomes pretty complex as system grows. Inversion of Control says that the objects should not itself create the object/component on which they are dependent to their work, instead these are passed from external sources. Due to DI’s long list of advantages it has become the norm in software development. But implementation in earlier versions of ASP.NET was not straight forward. Although there are different extensions and libraries made our life easy but ASP.Net as a framework was not open for the same. Due to these kind of new challenges, Microsoft has overhauled the complete framework and made the changes from ground up. The new framework is modularized and using the DI at its core. ASP.Net Core itself provides basic IoC container that we will discuss and later we will how we can use other. As mentioned earlier that ASP.NET Core uses DI for instantiating all its components and services. This container is configured in startup.cs class which is the entry point to an ASP.NET Core application. In Startup.cs we have method ConfigureServices which is where we configure all the services that can be later used in the entire application’s life cycle. Let’s see what all are the options provided by ASP.NET core. ASP.NET Core provides above three options to register the services. Let’s discuss each. Services registered using this method get instantiated each time it is accessed. If we have a service which is used multiple places in same request, a new instance would be created each time. This method should be used for lightweight, stateless and rarely used services. Let see an example. Here we can see that in the same request we are getting two instances as expected. In case of AddScoped, only one instance is created for each request, regardless the number of times it is used in the request. So if you have a service which maintains some state in each request or used frequently then it could be a better choice. As expected here, two different instances gets created for different request while it is unique per request. As the name suggests, it created only once instance which get created in the first request itself. In every subsequent request, same instance is used. So, if there is requirement of a singleton behavior, maintaining state across requests then this option is best. Creating our own singleton behavior is not recommended. It provides two important flavors. So if we have some custom heavy object that can be used across request or do some changes in the instance before registering then second option is good. Here we get the same instance across multiple requests. For basic usages of DI, we can use the default DI container but for the advance usage, we can use any third part DI container with the ASP.NET like Autofac, Unity, Ninject etc or some custom one. For that we need to have an adapter which provides implementation of IServiceProvider or we can write our own. We have already the required implementation for Autofac which can be easily integrated. let’s see that. It’s very simple to leverage to use the power of Autofac. We need to include the following package in our project. Once that is added, we need to make few changes in ConfigureServices Method. By default, it returns void but to use other provider, it should return IServiceProvider. We will create the instance of ContainerBuilder then register our services. Then get the container and return the service provider from the context. Here we can see that we provided the life time of the instance while registering the service similar to AddScoped. We can also see that we used default container to add mvc, it means we can mix and match with containers. Dependency Injection is very helpful for writing loosely coupled and testable software. Its usage with earlier versions of ASP.NET was bit tricky but with the new version ASP.NET, It has become the first-class citizen of ASP.NET Stack. We have seen that it provides a basic DI container and discussed with an example with details. Also, we discussed that how we can configure other third party containers like Ninject, Autofac, unity etc. We have configured Autofac in our example and saw we can use multiple container in same application. I am very excited to share you that I will be speaking in C# Corner Annual Conference 2016 which is taking place in NCR at COUNTRY INN & SUITES, Ghaziabad on 19th March’16. C# corner conference is North India’s largest developer conference where top notch speakers talks on technology and attended by thousand’s of attendees. I am presenting on the awesome features of ASP.NET Core (Previously known as ASP.NET 5/vNext). I will be speaking in NCR after quite some time so very excited to meet you all again. For the details of the conference, please click here. Do register for the event if didn’t yet and can connect me if need any more info or for registration. There are many International Speakers are are speaking first in India. Refer the Agenda. So dont miss a chance to attend an awesome event.